What is Dry Eye Syndrome and What are the Causes? Have you found that no matter the time of day, your eyes are full of tears or constantly itchy? There are quite a few symptoms of dry eyes, but typically your tear system is irregular causing the symptoms you’re experiencing. Dry eye syndrome (DES) is when an individual doesn’t produce enough quality tears to correctly lubricate eyes. While dry eyes are often a part of the aging process, it affects millions of people. The sun, types of air and climate, altitude, and indoor heating and air conditioners can cause dry eyes. People with arthritis and diabetes are more prone to having dry eye. Dry eyes are especially common in the older population and in women. During or after menopause, women often experience dry eye syndrome since there is a decrease in hormone levels. Pregnancy, menstruation and the use of birth control are additional hormone-altering contributions to dry eye syndrome. There are certain medications, including antihistamines, decongestants, blood pressure medications, antidepressants, and anti-anxiety medications that factor in the reduction of tear production. Several diseases can cause dry eyes, including thyroid deficiencies, sjorgens syndrome, rheumatoid arthritis, autoimmune disorders, Bell’s palsy, and myasthenia gravis. Long-term use of contact lenses and injuries to the eye are factors in reducing eye tears. While having dry eyes is a factor, sometimes an unrecognized sign of dry eye syndrome is excessive tearing as the eyes still feel dry and itchy, but a poor oil layer of the tears causes them to tear continuously. There are plenty of other factors that can cause dry eyes in individuals, but these are some of the more common ones. Dry eye syndrome can vary among different people. The three levels include mild, moderate and severe. Depending on the level of dryness you have, you’ll experience different symptoms. Dry eye is a treatable condition. Intense Pulsed Light uses light energy to soften dark spots or eliminate red vascular areas on the skin and is also commonly used for hair removal. It has also been used for nearly a decade to treat dry eye symptoms. It is believed to exert an anti-inflammatory effect by reducing small, surface blood vessels around the lid margins. Additionally, the heat generated by the light energy helps to thin the Meibomian gland secretions that are designed to prevent evaporation of the water component of the tear film. We have had great success using IPL for dry eye treatments since 2012. A typical treatment schedule is a monthly session for 3-4 months, followed by maintenance treatments once every 6-12 months as needed. IPL is limited to lightly pigmented skin types as it can cause patchy depigmentation in dark skinned patients. We are excited about Thermi, our newest addition in the fight against dry eye. Thermi uses radiofrequency energy to stimulate collagen production and smooth surface wrinkles on the skin. It has also been noted to improve dry eye symptoms in patients when utilized around the lids. Since it does not use light energy, it can be used on all types of skin pigmentation. In order to determine the best treatment, we need to see you for an eye exam and then determine the most appropriate type of treatment listed above. Contact us today to get relief from your dry eye symptoms. TrueTear is a neurostimulation device that temporarily increases the production of your natural tears. The fact that it is your natural tears is important. The natural tear film is composed of lipids, mucins, proteins and salts that are vital to the nourishment and protection of the cornea. 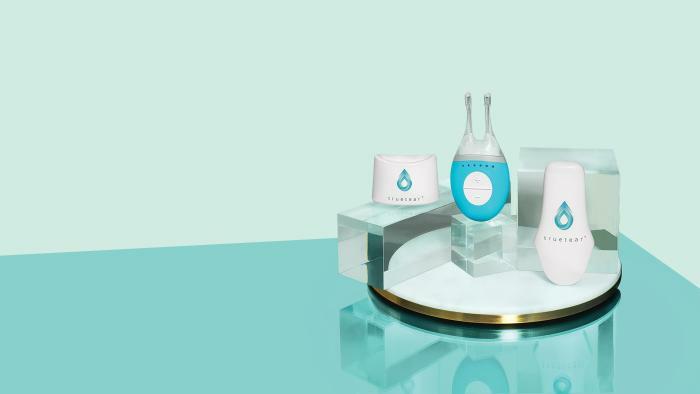 TrueTear works by stimulating a nerve in the nasal cavity with small pulses of energy. This nerve sends a message to the brain, which then sends a signal to the nerves surrounding the tear glands. This results in a temporary increase in natural tear production, both the lipid and muco-aqueous components. Do you have questions about the health of your eyes? If you're ready to take your eye care to the next level please reach out to us to learn more about next steps. Are you getting ready to come in for your first appointment? If so, we will need you to fill out some initial forms to get started.